First off, Queen of Air and Darkness took me awhile to get through, not because of the length of the novel, but because I was going through a lot mentally and I just took multiple breaks with it. This third and final installment to The Dark Artifices picked up directly right where Lord of Shadows left off and that made my heart so heavy and broken throughout the first half of this novel. I wouldn’t be able to tell you how many times I cried within the first 30-50 pages. Everything just tugged at my heartstrings more than the previous novel, especially when a certain character’s name was brought up. I ended up sobbing multiple times until I got through of the novel. 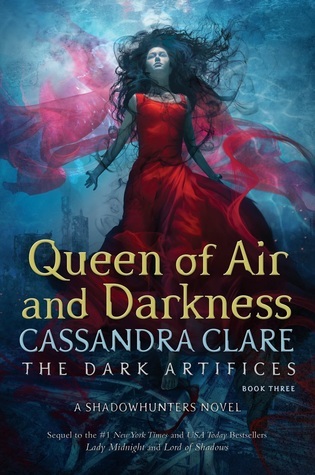 Reading Queen of Air and Darkness made me fall more in love with all of the original characters that were in Cassandra’s previous novels, however in some scenes of the novel I did end up becoming a little annoyed with Jules and Emma. Yes, I love them as characters, but with some scenes with those two in it was a little unnecessary.